This game perplexes me as does most of the White Wolf merchandise. To start with, Vampire: Prince of the City comes in a square box which is fairly deep. Within the box are the following contents; a rule book, fold out game board of the city, a deck of 100 game cards, five character cards, five miniatures, five ten-sided dice, three sheets of counters and tokens to be punched out. In the usual White Wolf fashion, the rule book is full of double talk and more flavor text than you can roll dice at. As always, flavor outweighs rules in the White wolf bullpen. I strongly suggest you seek out someone who has already learned to play this game, learn from them and then attempt to read the instructions. However, that leaves one to question, what came first; the chicken or the egg? The miniatures are promising as they’re unique, representing the five main Primogen vampires. This leaves me clamoring for my Sabbat characters.The back story for this game is simple. Since the beginning of Man, the children of Cain have been cursed with the dark gift of Vampirism. For centuries they have moved throughout the shadows of man, avoiding the wraith of the Church and the schism within their own ranks. The world of today an alien place, most Kindred are stuck within the time frame of when they were embraced. With all cities, there is a Prince. The Prince is who the Kindred of the city turn to for guidance and leadership. Now the Prince is dead, slain in battle and his rule is threaten by the enemies of the Kindred within and without. It’s up to you to fill the void and ascend to new heights of rule. Do you have what it takes? The game, once you’ve sifted through all the flavor text, is simple. It’s all about building yourself up, scoring reputation and prestige over other players and being the first to have the largest controlling chunk of board space. You gain Prestige by taking areas of the board, the board being the realm of the deceased Prince’s rule. You have to overcome problems and lay traps for your opponents for them to overcome. Your character in the game can just as easily be sent into Torpor, the undead rest of the slain Vampire. Not only can prestige be gained, it can be lost and you can become hated as well as feared. The Blood is the life! Blood is important and you must keep track of your own. From your disciplines to your bargaining power, blood is the grease which makes the wheels of the Kindred society turn. All-in-all I’m yet again another Vampire: The Masquerade or World of Darkness fan boy. So my opinion of this game is moot. 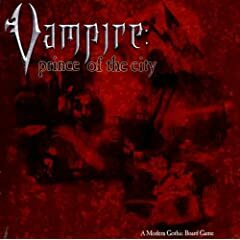 From an outside, non-biased approach, I’ve to say like its parent RPG which it’s based on, Vampire: Prince of the City is rather lame but based on a good concept. I’ve gleaned quite a few decent Chronicle ideas from this board game. Which is where the Pros lay: it’s a nice companion piece to the RPG. The characters are strong as NPCs and it offers an interesting insight into how the politico of the world of Vampire works. Simply put, if you’re going to play a Vampire White Wolf game, why not just play the Vampire RPG? Like most board game brood of Role Playing Games, Vampire: Prince of the City is just as weak. Reading the above review, I’m wondering if the reviewer has played the game at all. At first glance, the rulebook may seem somewhat overwhelming, but sowewhere during the second gameturn things start falling into place and gameplay appears to be well-thought-out and smoothly. Contrary to the previous report, there is no abundance of irrelevant background writing. Instead, the rulebook is sprinkled with a lot of helpful gameplay examples. This is not just a bleak spin-off from the RPG, but it’s a really-fun game of trading, negotiating and some blooddrinking. Don’t expect it to be fun with anything less than 4 players, though.